Headed to the beach this summer? Check out these super fun frugal beach ideas! Ahhh… summer vacation! THREE MONTHS of uninterrupted play with friends in the neighborhood? Yes, please! But now that we’re parents, summer vacation doesn’t seem nearly as appealing as it once did. Between sibling fights, what activities to set up, and making sure the kids aren’t spending the entire summer in front of the TV, how to survive summer vacation can be a real chore for parents! But with these tips and ideas, you’re going to have a great summer vacation! I actually really love the weeks that I get with the kids every summer when we are able to do lots of fun things and not having to worry about homework or having the school schedule interfere. The time will go by super fast and before you know it, they’ll be grown and on their own. So enjoy that time now, parents! Having a Summer Bucket List is a great way to keep the kids excited about things that may be coming up over the next few months. HollyMcBerty.com has a great printable above that you can use to get started, but what a great way to get the entire family together to create your own summer bucket list! 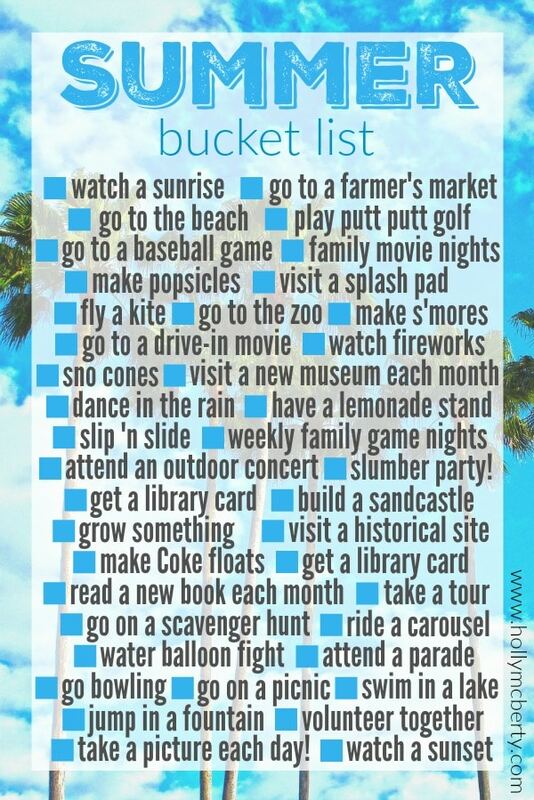 You’re going to have a bucket list all set for the summer before you know it and everyone is going to be so excited to check different activities off of the list. 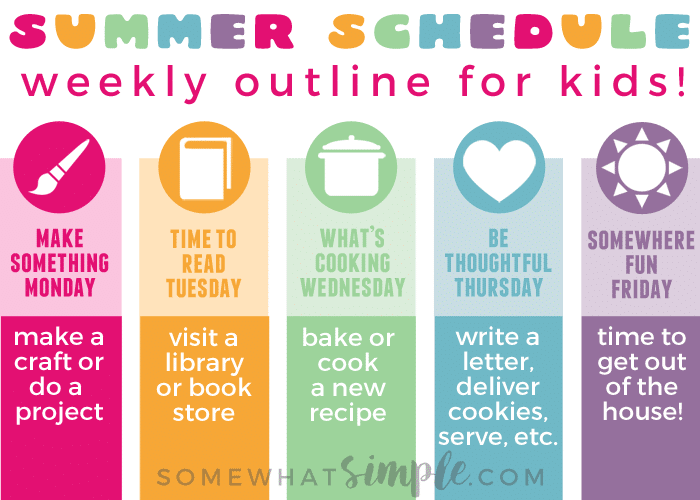 I just love this idea and what a great way to make sure you have great ideas already set for when things start getting a little long during those hot, summer days! Another great way to survive summer vacation is to find fun free things to do in your local community over the summer months. TheJennyEvolution.com has 200 great ideas for things that she has found to do in her area and it’s a great way to get out of the house and not have to spend a ton of money. I know my kids always want to go out and do something, but going to the same park day in and day out can get a little monotonous. And I don’t want to spend money every time they want to go to a jumpy house or a zoo, so this list really got my creative juices flowing on things that I could take my kids to during the summer that won’t cost us one red cent! Incorporating daily ideas/themes is a great way to make sure everyone in the family survives summer vacation too. Instead of constantly hearing “what are we going to do today” and trying to figure it out at the last minute, have a theme for what every day of the week will entail. You can even grab a free printable to get you started at Kaysepratt.com! 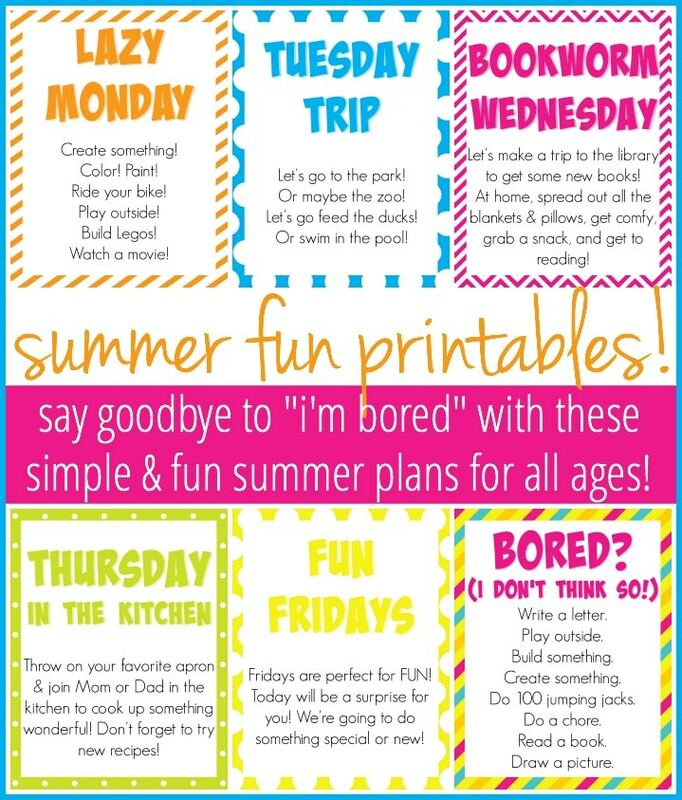 I really love the idea of having loosely planned ideas that the kids can be prepared to do each day of the week. That way, they know that there is a plan, but it’s also not so rigid that you have to spend all of your free time making detailed lists on what you’ll do every second of every day. Another bonus? They know what is coming and may have ideas of their own on how to fill in the “theme” of the day. Nothing like keeping the kids involved with things they are excited to do to make the summer breeze by! It can get hot, hot, hot in the summer, so be prepared to figure out ways to enjoy the weather without getting overheated. That’s where these great outdoor water ideas from RaisingWhasians.com come into play! Kids love playing in the water, but if you aren’t sure how they can enjoy the water in your backyard, this is definitely for you! From playing with water balloons, to sprinkler fun, along with creating your own unique outdoor water games, the kids are going to love when the sun is shining and they can get outside and splash around. If you are a planner, these summer schedule ideas might be right up your alley! 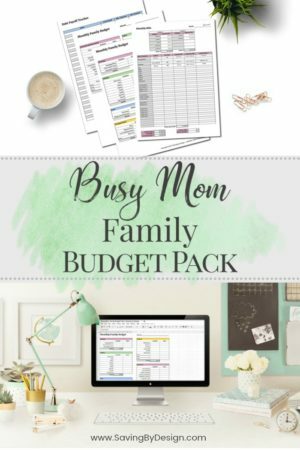 HelloDesignLove.com has this absolutely nailed and we love how she has set up the schedule for her family over the summer months. Obviously, things may change and you can adjust as necessary, but kids really do respond well to schedules and knowing what is going to be happening next. I know mine do! Another thing I love about this idea is that the kids are quite aware of areas where they will be required to help out over the summer. Dinner prep? They’re involved. Clean up after meals? It’s part of their schedule everyday. It also helps them to see how long they may be asked to be quiet and find an activity that is more low-key for a small amount of time. 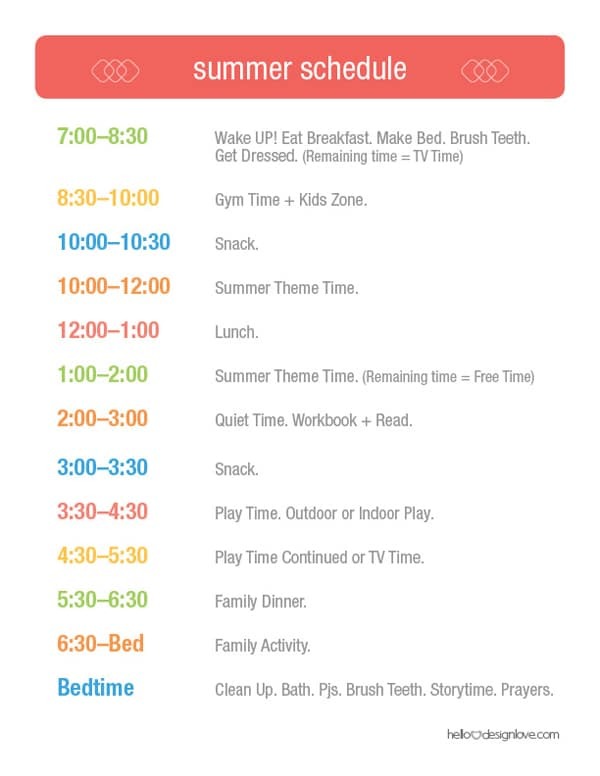 What a great balance that helps keep that “school year schedule” relatively into play. You’ll be able to switch back to the school year this fall easily since they’ve been used to following a schedule all summer, too! One of my favorite ideas to survive summer vacation? Summer Camp At Home! What a fun and unique idea! CoffeeCupsAndCrayons.com has some great ideas in the picture above on how she structures the summer fun for the kids. 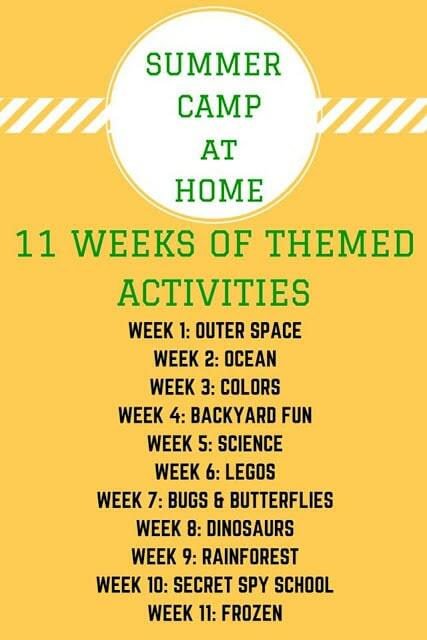 Every week has a different theme and it’s a great way to break things up for the kids too! We all know that with the help of Pinterest, you’ll be able to fill these weeks up with the themed activities pretty easily. An even better idea? Recruit a group of friends and put on the “summer camps” together with a larger group of kids! I love this idea of getting my girlfriends together, each taking a week, and hosting the camp at that person’s house. It will give you a break of constant “togetherness” and will help keep everyone excited for the different environments and activities they’ll be able to experience with each camp theme. Just like that, your summer is going to fly by and they will be back off to school before you know it. And guess what? When they head back to school, you’ll wonder where the summer went and that you had a few more weeks of sunny summer fun! Enjoy! 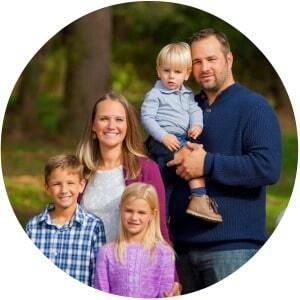 > Frugal Summer Activities for the Kids – Pick Your Own Farms!